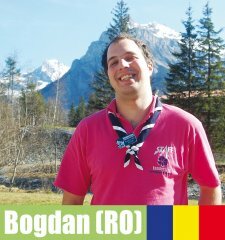 It’s Bogdan Pater from Romania, your one and only source into the “scandalous” lives of KISC Pinkies. Despite the Icelandic ash cloud KISC is still operating and at full throttle I might add. This is a very busy Spring season! Besides the usual daily cleaning, cooking and the special deep cleaning on top of the ongoing maintenance and overall preparations for Summer, we also have quite a few important meetings taking place at KISC. We’ve already had the World Scout Committee Meeting and the World Scout Bureau – Executives Directors and Full Staff Meeting and now it is the AGORA 2010 going on but there are also other events coming up. Anyway, all this hard work could not be possible without some serious fun and partying in between. Things like Swiss wrestling, mini-golf and ice-cream night keep the Pinkies going and recharge our batteries so that we can run the Centre and keep the dream alive. The whole KISC experience is awesome! Pink yourself by becoming staff here as soon as possible! I don’t have space here to write all I would like to but I have a “Living at KISC” series on my personal blog where you can find out more over there.